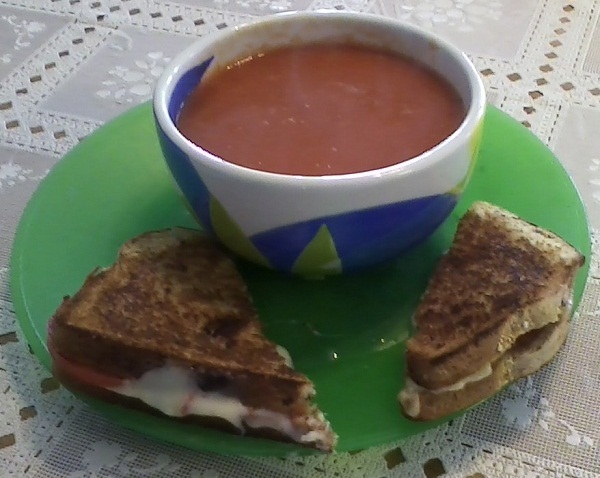 When I was a kid and came home from a snowy winter’s day of making snow forts, having snowball fights and building snowmen, there was nothing that brought more warmth and comfort than a bowl of steaming hot tomato soup and a grilled cheese sandwich. Mmm, Mmm, good! I’m drooling. With the abundance of the crop-end of Jersey tomatoes, I’ve been frantically trying to come up with things to make before they spoil. I’ve made quite a few quarts of spaghetti and pizza sauces. And then I thought about what it would be like to concoct a tomato soup that would taste just like those many bowls of soup from way back when. I came across a recipe that comes pretty darned close and wanted to share it with you. I’ve also added a bruschetta (pronounced, I’m told, “brusketta” in Italy) recipe and another recipe I found from Michael Symon of The Chew for fried green tomatoes. In a stockpot, over medium heat, combine the tomatoes, onion, cloves and chicken broth. Bring to a boil and gently boil for about 20 minutes to blend all of the flavors. Remove from heat and run the mixture through a food processor or blender and then pour into a bowl. In the now empty stockpot, melt the butter over medium heat. Stir in the flour to make a roux, cooking until the roux is a medium brown. Gradually whisk in a bit of the tomato mixture so that no lumps form, then stir in the rest. Season with sugar and salt and adjust to taste. You can add chopped basil and cream for a creamier taste, or garlic and olive oil for a Mediterranean flavor. I like just like it plain. Chop tomatoes, onions, garlic and basil, mix all ingredients together, salt and pepper to taste. Heat oil in a cast iron skillet. Arrange flour, buttermilk and cornmeal in three separate bowls. Season the flour with salt and pepper. Dip the tomato slices into the flour, then buttermilk, then cornmeal to coat and then put into hot oil and fry for 2 – 3 minutes per side until golden blown. Do not crowd pan. Transfer to a paper towel lined plate. Combine ingredients in a blender until emulsified. Season to taste.